If his games were any more 8-bit you’d have to blow on the disc before putting it into the Wii. We talk pixels and punks with Suda51. The creative force behind Grasshopper’s eclectic output, Goichi Suda enjoys a huge reputation outside of Japan and the reasons are many – not least the fact that he appears to be a thoroughly amiable chap. 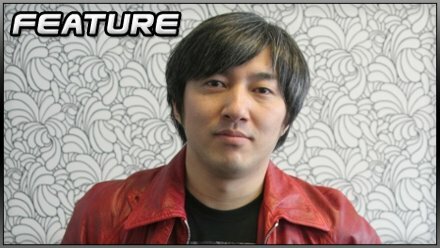 Unlike the Kojimas or Miyamotos of the development community, Suda’s work isn’t the most widely played or the most commercially successful. Even the most ardent follower would have to admit that the likes of Michigan: Report from Hell or Flower, Sun and Rain can be deeply esoteric and often lacking in polish. Yet despite such variation in acclaim, Suda’s games all share one commonality – they all leave an indelible impression on the player. From Killer7, to Contact, to No More Heroes, each shows that streak of individuality – that unwillingness to conform, that wry wit, that radical design. His output is the very definition of cult. 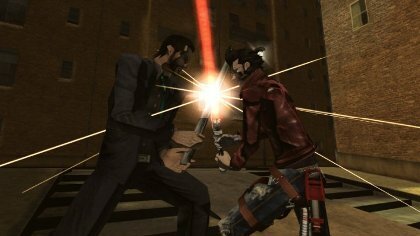 In a nod to the less adventurous, No More Heroes 2 can be controlled with either the remote and nunchuck or just the classic controller. What better place then than London, the home of punk, to sit down and discuss design philosophy, retro gaming and cranberry chocolate sundaes? 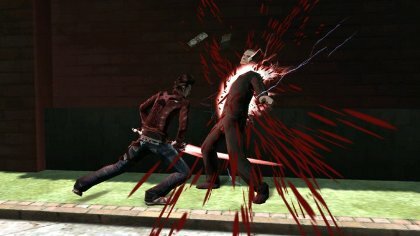 “Punx Not Dead” reads the title of No More Heroes 2: Desperate Struggle – a fairly self-evident axiom given what we know about Suda’s style, but what does it mean to the man himself? “I’m happy to be back in London because the soul of punk is in London, but like we have no samurai in Japan, it’s hard to see a punk in London,” says Suda disappointedly. Grasshopper’s motto is as much about what it seeks to avoid as it is as a statement of defiance. “Punk to me means to create something that has never been done – always something new. That kind of spirit I want to be in the game and in the studio and never to be dead”. Of course the satisfaction of executing the original game's gestures is lost if you opt for the classic controller, but you will expend less energy. Many modern games have appropriated the stylised pixel art of the 8-bit era – the original NMH flirted with 8-bit aesthetic for the interface and much of the sound design, but NMH 2 drags us right back into the 1980s with the inclusion of an extensive medley of 8-bit tiles. Simultaneously addressing the original game’s most criticised aspect and building a more cohesive 8-bit homage, NMH2’s side jobs are resolutely retro while somehow never stooping to the level of clone. Obviously holding the 8-bit era in a great deal of reverence, I ask Suda what his favourite 8-bit game is and his response is characteristically unexpected. “The Star Wars vector scan arcade game” he says enthusiastically imitating the sound of an X-wing. Inarguably the product of the 8-bit era, Atari’s 1983 classic is the last game I could’ve anticipated being Suda’s number one, hailing from the country that bought us Pac-Man, Space Invaders and Donkey Kong, but then his interest in Western culture has always been distinct. 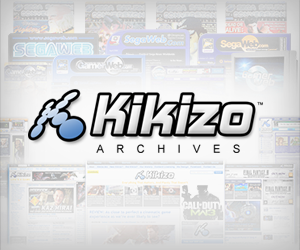 Posted in Features, Spotlight, and tagged with Desperate Struggle, Goichi Suda, No More Heroes 2, Suda51, wii.